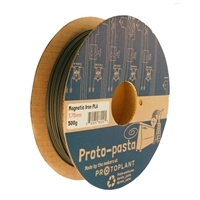 Proto-pasta Rustable Magnetic Iron Metal PLA Composite is actually ferromagnetic. It responds to magnets and behaves similarly to pure iron! Encapsulated in plastic, the iron maintains a stable matte, cast metal finish as printed, but can be rusted when desired. Usable on most PLA-compatible printers, such as Lulzbot, Makerbot, FlashForge, Dremel, Ultimaker, Printrbot, and more!